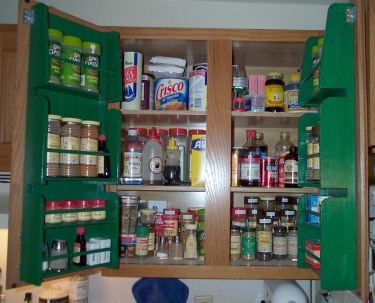 Here is an extremely simple but useful project - a door mounted spice rack. 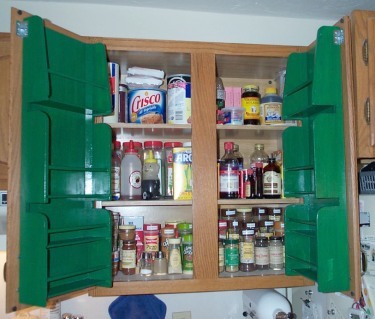 The idea is quite simple - mount a rack on the inside of each door of a kitchen cabinet to make it easier to see the various spice bottles. The unit is made from leftover wood - 1/4 inch thick plywood for the back, 1/4 inch thick recycled pallette hardwood for all surfaces. The only thing I bought were two 5/8 inch diameter dowels that act as retainers for the shelves. Each shelf is dadoed into the side panels, as is the plywood back. The sides are notched to fit the door opening (the shelves in the cabinet fit into the notches). To hold the unit onto the door, I used two screws below the bottom shelf and two right-angle metal brackets on the outsides at the top. To give more wood for the top screws to bite into (as well as to give added strength), 45-degree blocks were glued to the inside of the top two shelf areas. Everything is asembled with wood glue and given a coat of green paint. Here are three views of the spice rack. The first is just the left unit; the second and third pictures show both units in use.